Humor is a tool underutilized, and comedy has the power to effectively connect with people about climate change issues. Our event is associated with the Spring 2019 ‘Creative Climate Communications' course and the larger 'Inside the Greenhouse' project. 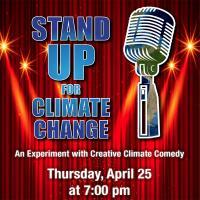 A night of comedy skits from CU Boulder students about climate change issues. The 2019 winners from the ITG Comedy & Climate Change Short Video Competition will also be announced and their video submissions will be shown at the event.